We already know that Miss South Africa Rolene Strauss has been crowned Miss World of 2014 at London, but what comes as a lovely surprise to Malaysians is the winner of Miss Talent is none other than our very own Miss Malaysia Dewi Liana Seriestha! Making Malaysia proud, Dewi, who is an ex-contestant of Malaysian reality singing show “Mentor”, won the Talent Contest in a live singing competition against Miss Scotland where she sang “Don Juan Triumphant” from “The Phantom of the Opera” musical. “I chose to sing this song because I know it best compliments my talent. At the same time, it is also to show the love I have for classical music and showcase everything that I have learnt throughout my vocal class,” said Dewi as quoted from The Borneo Post. The 25-year-old Miss Malaysia was born in Kuching, Sarawak to a Chinese Indonesian father, Yudhi Seriestha, and a Dayak Bidayuh mother, Catherine Noep. With a height of 179cm tall, Dewi is the third and tallest child in her family among her four siblings. She is currently a student at the ASWARA School of Performing Arts and has always been passionate on classical opera singing. The Sarawakian beauty queen entered the entertainment industry since 2005 and with her tall and slender figure, she now works as a model and an actress. 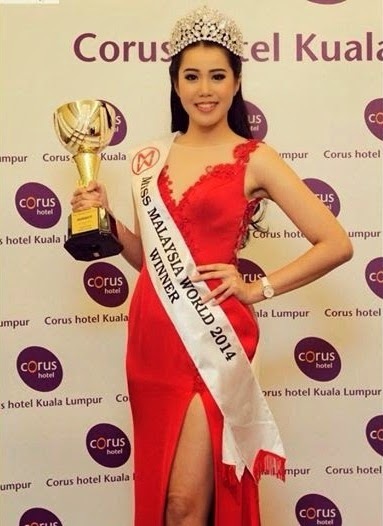 Congratulations to Dewi for being the first Malaysian to ever win a category in Miss World Beauty Pageant! Check out more pictures of Dewi Liana Seriestha at Miss World 2014 in London below.